Barb and I were in Adams back in February for a day of skiing/riding at Jiminy Peak back in the Berkshires of Western Mass. We stayed at my parent’s house and helped do a few home repairs mostly having to do with a leaking basement foundation wall. Anyway, we went for a walk and took some pictures to try out the new camera. 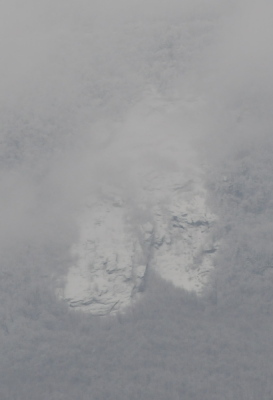 We had the zoom lens on and we took this photo of the landslide on Mount Greylock which I just learned has it’s own wikipedia entry now. Unfortunately there were a lot of clouds so the photo did not come out that great. However, when we downloaded it off the camera at home, it was surprising to see how much the area looked like the face of an Indian chief looking sideways to the right. What do you all think?